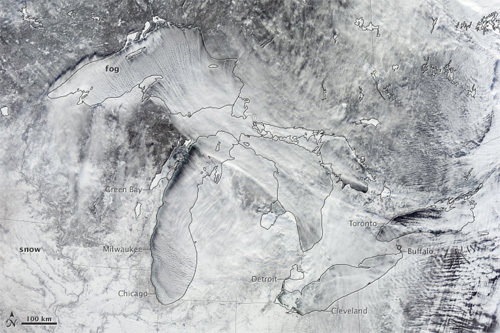 Will North America’s Great Lakes completely freeze over this year? Jay Austin believes they will. Austin is an associate professor at the Large Lakes Observatory in Duluth, Minn. Many consider him an expert on Great Lakes’ freezing. In an interview with CNSNews.com, Austin says Lake Superior, the largest of the Great Lakes, will completely freeze over this winter due to the “extraordinary cold weather.” At 31,700 square-miles in size, Lake Superior is the largest of the Great Lakes and the slowest of the five lakes to ice over. The previous record freeze over for Lake Superior was set February 5, 1994 when ice coverage reached 91%. As of February 10, 2014, ice coverage on Lake Superior was 87.1%. Last year at this time, only 38.4% of Lake Superior was covered in ice. The record freeze over for all five Great Lakes was in 1979 when ice coverage reached 97.4%. Duluth where Austin is based has already broken a cold record. The city experienced 23-consecutive days of temperatures of below 0, breaking the earlier 22-day record set in 1963 and 1936. The cooling effects of the Great Lakes will be felt in the area well into the summer as the lakes have an “air conditioning effect” due to their massive size. The five lakes — Superior, Michigan, Erie, Huron and Ontario — cover 94,250 square miles (244,106 km2). Ironically, we reported concerns expressed by astronomers a few weeks earlier about the lack of solar activity — sunspots and solar flares — on the sun. The sun goes through a regular 11-year cycle ranging from periods of high solar activity to periods of low. In 2013, astronomers expected the sun to enter its high active stage, but instead it has gone strangely quiet. This has not only puzzled scientists, but concerned them as well as it could forewarn another mini ice age. By breaking the 11-year cycle, there is concern the sun may be entering an extended period of low-solar activity called a Maunder Minimum. Using solar records that go back 400 years, astronomers noticed a correlation between the occurrence of a Maunder Minimum and a mini ice age the earth experienced during the middle ages between 1350 and 1820. During one 30 year period, only 50 sunspots were recorded where you would typically have about 40,000. Exactly as its name suggests, the mini ice age consisted of a period of unusually cold weather both in the summer and winter. In England, the Thames river completely froze over and they held winter carnivals on the ice from 1607 to 1814. In North America, the New York harbour completely froze over in 1780 allowing people to walk from Manhattan to Staten Island. There were also record amounts of snow fall and Europe was rocked by violent storms, similar to what we are seeing in England today. It will take more than one year of cold weather to determine if we are in the beginning stages of a mini ice age. But scientists are reporting the warming trend stopped about 15 years ago and some suggest a cooling trend has already started. Previous PostBlood moons, a sign of the times? Next PostWhen your dentist says there is no God because of suffering in the world!